Wicklow is an old and historic parish tracing its origins right hack to the time of St. Patrick. The Celtic name of the district was Kilmantan, or the Church of Mantan, who was an attendant of St. Patrick. The old church was situated in the cemetery on Church Hill but no remains of it now survive. During the Penal Days the Catholics of Wicklow worshipped in little chapels in Monkton Row and Melancholy Lane which were often raided and closed up. In 1641, the chapel in Melancholy Lane was raided by the notorious Charles Coote, its priest Fr. O’Byrne was murdered along with his Congregation. Archdeacon Andrew O’Toole Parish Priest (1788-99), built a permanent church in 1797, sited opposite the present church. It was one of the few churches in the country that escaped destruction during the 1798 rising of the following year. While awaiting possession from Lord Fitzwilliam of the present Parocial house Fr. O’Toole was residing at Cronroe, Ashford, returning there on the night of 23rd of August, 1799. he was set upon and strangled in the hollow of Tighe’s Avenue. Fr. Matthew Blake during the 1950′s re-constructed the old church to fulfil the roll of Parish Hall. Today it operates as a Youth Centre and is no longer in the ownership of the parish. The Parish of Wicklow has at present an area of 6.300 acres and is comprised of more than 30 town lands. In 1846 Ashford and Glenealy became a new parish and V. Rev. T O’Carroll DD who had been a curate in Wicklow was appointed first Parish Priest of the Parish of Ashford. “The venerable Church had been turned into a court house which was then filled by noisy and irreverent litigants. The cloister and other appurtenances were sadly dilapidated and falling into shapeless ruin. The chancel arch and its beautiful windows prove that it was a graceful structure, creditable to the piety of its founders, and the architectural science of those they employed to build it”. 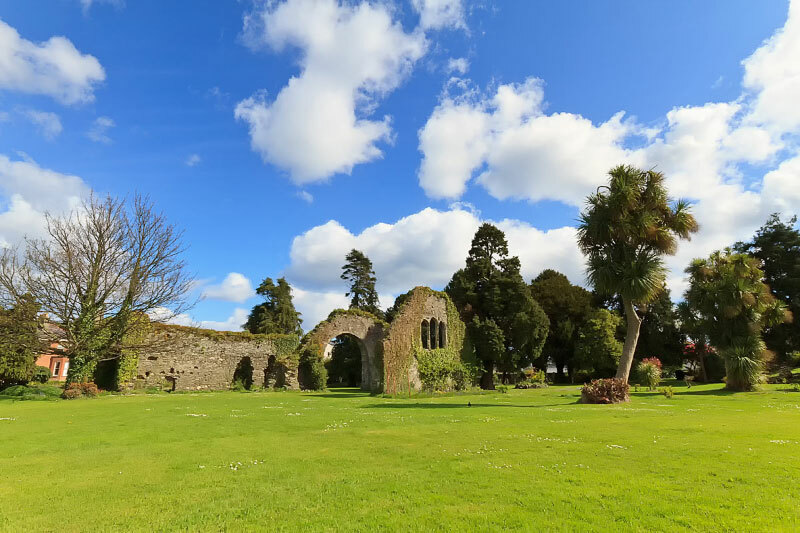 In 1799 Archdeacon O’Toole, Parish Priest of Wicklow, leased the house on the Abbey grounds from Lord Fitzwilliam. At the beginning of the 19th century it was bought out by the then PP John Canon Meagher (1799-1811), who was followed by Michael Canon Maguire (1811-26). In the years following the granting of Catholic Emancipation and the repeal of the penal laws in 1829 a new confidence appears to have been evident throughout the country in the number of new churches begun, despite the poor economic situation of the time. “The Catholic Church is a magnificent structure situated on an eminence overlooking the town and bay, and is a lasting monument to the tiny munificence and sacrifices of the Catholic Community of Wicklow. There are many beautiful Churches in the Diocese of Dublin, but very few can compare with Wicklow. Viewed from Church Hill, it looks like a continental Cathedral, and the interior decorations are very artistic, a special feature of which is the beautiful ceiling”. The people of Wicklow were very involved in the building of this Gothic style Church, local farmers drew the stone from the quarries and sailors transported limestone from Skerries, County Dublin. The Fitzwilliam family generously presented the site for the new Church to the Parish. In addition to the selfless generosity of the townspeople, contributions were received from Dublin, Wexford and England. Regretfully no knowledge exists of the architect or the builder of the Church. The Foundation Stone was laid in 1840. Archbishop of Dublin, Daniel Murray in the presence of a large and distinguished congregation celebrated the first Mass in ‘St. Patrick’s Church’ on Sunday, October 13. 1844. The High Altar of Caen stone was erected to the memory of Archdeacon Grant whose mortal remains together with those of his successor Father Patrick O’ Doherty (1864-76) rest in the vault in front of the high altar. The event for which Fr. O’ Doherty, is best remembered, and for which the parish will be forever indebted to him is the bringing of the Dominican Community to Wicklow. The Church Organ is dedicated to his memory. The Bell is one of the finest in Ireland, of a rich mellow tone, and can be heard fully five miles away. It weighs four tonnes and was installed on November 24th 1889 by V. Rev. William Canon Dillon PP (1880-94). The tone of the Dublin made bell has been compared with that of another four-ton bell in the Basilica of St. John in Lateran, Rome. It was brought from the railway station to the Abbey corner on a gun carriage, which was borrowed from the Militia. From there it was pulled with ropes by the townspeople to the foot of its final destination. Four of the church windows are of stained glass. The windows over the side altars show Our Lady and St. Patrick and were presented by a Mrs Lalor and a Captain Darragh respectively. It was to the memory of Fr. Thomas Carbery Parish Priest (1899-1906) that the window in the east transept was dedicated, and presented by his parishioners. Particular mention should be made of the corresponding window in the west transept, from the Harry Clarke studio which, in the setting sun of evening, depicts in spectacular beauty the Birth of Christ, and was presented by a Mrs Murray of Main Street, Wicklow. The Presbytery, which can be seen to the left of the church was destroyed by fire in 1930 and was rebuilt immediately afterwards. The original building dates from 1890. In more modern times, ongoing development, restoration and where necessary modernisation of the Church and its environs continues. During the incumbency of Fr. Matthew Blake (1949-59) a major redevelopment of the church grounds took place, together with the building of the shrine to Our Blessed Lady marking the Marian Year of 1954. The narrow pedestrian entrance to the grounds with a steep flight of steps at the Chapel Hill was replaced with several more gradual flights of wider steps. The environs of the Church were re-landscaped opening new vistas of the Church. A wide and more open entrance was constructed opposite the old church with additional car parking provided in the church grounds. The first modern sound system was installed in St. Patrick’s during this period. With the transition from the Latin Mass to the Vernacular, facilitating and encouraging more participation of the congregation came also a change in altar style. Instead of erecting a modern altar table as many churches did. Canon Anthony Crinion, Parish Priest (1970-83) had the magnificent altar skilfully divided and the table section moved forward. The furnishing of the surrounds of the high altar was completed only two years ago when Fr. Francis McDonnell Parish Priest, (1997-2005) had a new Ambo and Presidential Chair constructed in the style of the altar. The latter was presented by Monica Duggan in memory of the Duggan family. The village of Rathnew is associated with St. Ernan who studied at Clonmacnoise. On the site of the old burial ground in Rathnew is the remains of an ancient church, however, only a fragment remains. Two notable Parish Priests of Wicklow are buried there, side by side. Rev. William Cavanagh (1704-17) and his nephew the Rev. Stephen Cavanagh (1747 – ). St. Joseph’s Church Rathnew was completed in 1882 by Canon William Dillon, Parish Priest of Wicklow. The first Mass was celebrated on Easter Sunday of the same year. The school in Rathnew opposite the Church was built by V. Rev. Michael Canon Hoey PP Wicklow (192349). In 1965 during Fr. John Kingston’s incumbency as parish priest of Wicklow (1964-70), a second school was built, providing separate accommodation for boys and girls in the village. In 1941 John Charles McQuaid, Archbishop of Dublin, appointed Fr. Patrick Lavelle as Rathnew’s first resident curate. 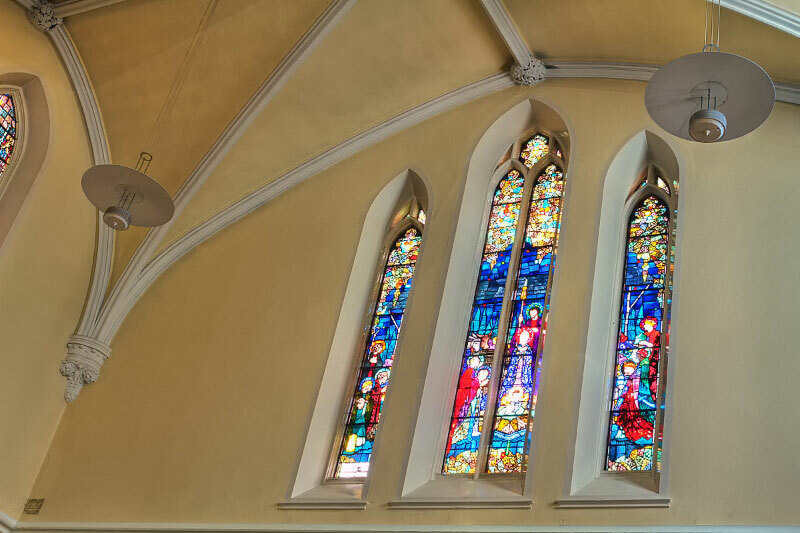 In recent years, there was a complete re-decoration of St Joseph’s, together with the installation of new stained glass windows. Since the advent of the Second Vatican Council the church has repeatedly recommended the development of Pastoral Councils as a means of encouraging the shared responsibility of all the baptised in the life and mission of the church. Addressing a gathering of 100 bishops of Asia in New Delhi on 18th, November 1999 Pope John Paul II proposed that they foster greater involvement of the laity and consecrated men and women in pastoral planning and decision making through such participatory structures as Pastoral Councils and parish assemblies. In the autumn of 2004 Diarmuid Martin, Archbishop of Dublin authorised the establishment of Parish Pastoral Councils throughout the two hundred parishes of the Dublin Diocese. 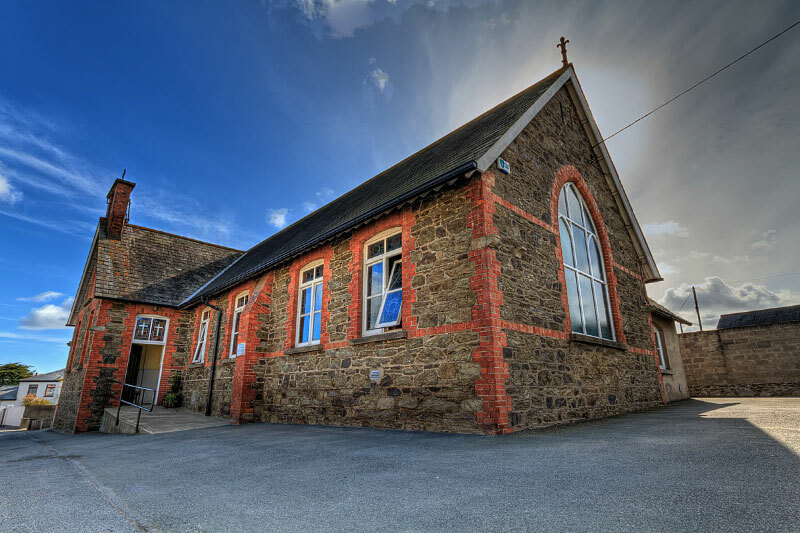 In the Spring of 2005 the process of selection of the members of the first Parish Pastoral Council for the Parish of Wicklow and Rathnew took place, and the new Council was presented to the congregation at Sunday Mass in the Autumn of the same year. The development of our parish will inevitably continue, while our immediate focus turns to the urgent necessity for the provision of a new Parish Pastoral Centre for the Parish of Wicklow. My thanks and acknowledgments in the preparation of this document must go to scribes of previous histories of the Parish and the general district of Wicklow.